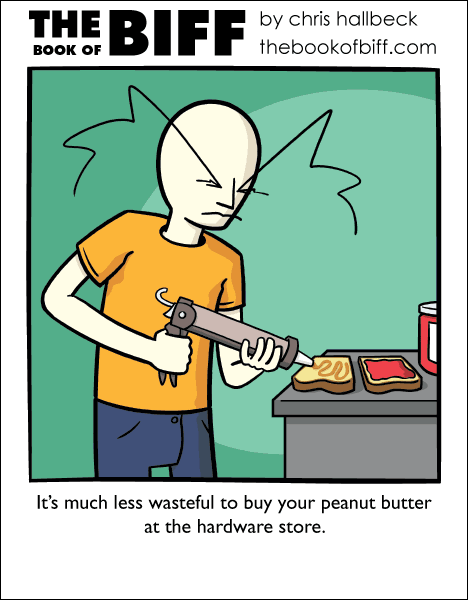 I always feel weird throwing out an “empty” jar of peanut butter. It never seems like it’s really empty. If only I had a tongue like Biff does in yesterday’s comic. Ooh! Sounds great for a halloween decoration! I hate this sentence. If they’d sell more stuff in tubes I’d be happy. Reminds me of my days working at Taco Bell…This was how we dispensed the sour cream and guacamole. Ok I’m no longer going there out of fear the sour cream is actually grout. I went to Baja Fresh the other day, and noticed them putting sour cream onto plates with a caulk gun! It was about as big around as a jar of peanut butter. First thought: That’s NOT peanut butter, Biff! Second (thanks, Lisa! ): Makes me think of astronaut food-packaging, probably the source of the MRE PB (just increase the order size, thousands vs. hundreds). Loose globs of anything in microgravity are disasters waiting to happen! This reminds me, I need to get one of those funny-looking knives that are made to get in every corner of a jar. I got to admit I’ve wanted this.